Was today really the start of spring? Could the end of this brutal and obscene winter finally be upon us? I almost feel like it's too good to be true, and that's why I'm glad Volvo is working on something that could put bad weather in its place. By now, you're probably familiar with the concept of the connected car, the nascent technology that allows vehicles to talk to one another, ideally for crash avoidance. Now in Sweden, Volvo is testing a system that will let cars warn other cars of icy patches on the roads. 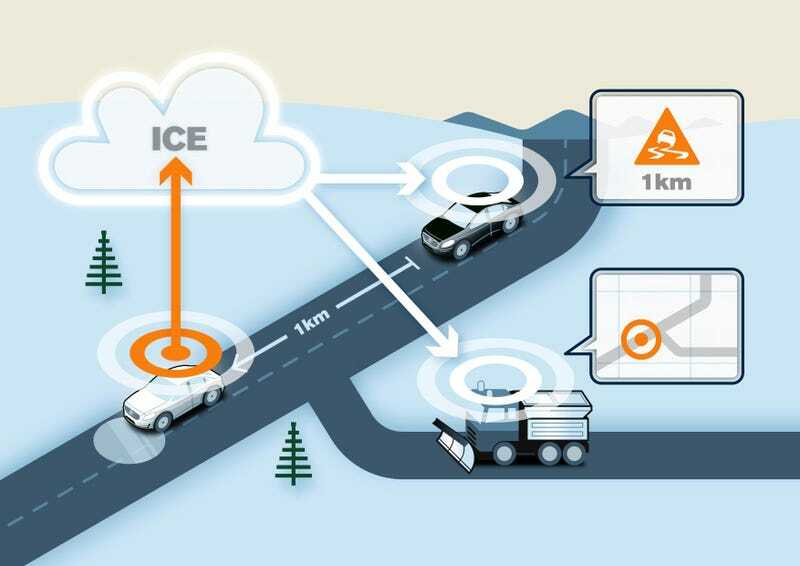 When the Volvo test car detects an icy or slippery road patch, the information is transmitted to Volvo Cars' database via the mobile phone network. An instant warning is transmitted to other vehicles that are approaching the slippery area, making it possible for the drivers to take immediate action to avoid a critical situation. A slippery road warning on the instrument cluster alerts the driver. The application in the vehicle will be designed to adapt the driver warning to match the severity level based on the vehicle speed and the present road conditions. The data is also sent to a "road administrator" who can use it to winter road maintenance more efficient and enhance existing safety measures. All of it sounds pretty clever, and an interesting use of cloud technology, which Volvo and other automakers are investing heavily in for automotive use. Volvo says they see a lot of potential in letting cars talk to one another. If it helps put Mother Nature in her place, I'm game.